SolarMax Technology Team Rider Jason Aguilar overcame qualifying problems to get back on the podium at VIR. Rain and wet conditions did not provide any time to work on dry race settings on Friday, and at the beginning of qualifying Saturday morning. As the track dried during qualifying, all the riders came in to switch to dry race tires to get the best lap time for the conditions. When Jason came in, one of his mechanics had a tool break that resulted in a lengthy delay getting the wheels changed to dry race tires on his 2017 Yamaha YZF-R6. The delay left Jason without enough time to get in a fast lap, and a disappointing overall qualifying position of 17th on the grid. 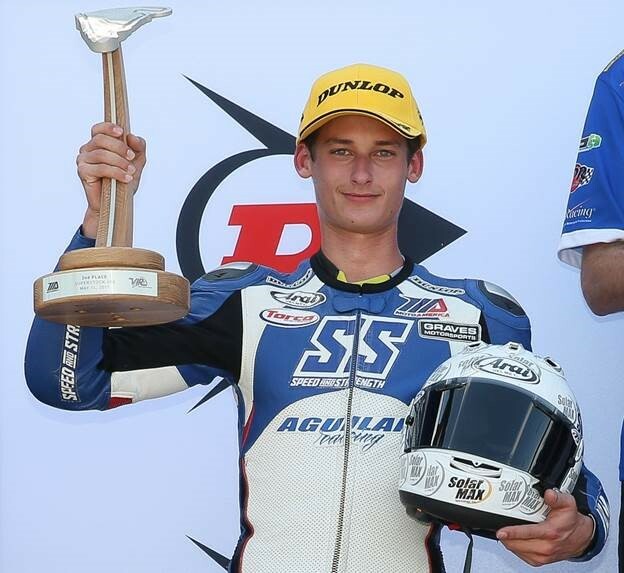 Coming into the race, Jason was tied for 2nd in points for the Superstock 600 Championship. With Jason’s main competition qualifying in the top 3 Superstock 600 positions, Jason would be starting the races with a big disadvantage. By Saturday’s race time, the track had dried and the racers were ready for battle. Jason did not get a good launch, dropping several positions on the first lap. The poor start put Aguilar Racing’s hopes for a Championship in serious doubt as the main competitors were battling up front for the lead at the end of the first lap, while Jason was 19th. By lap 2 Jason started rolling through the field. Halfway through the race, Jason had moved up to 6th in the Superstock 600 class. With 2 laps to go. Jason had moved into 5th. Pushing hard, Jason moved into 2nd place at the start of the final lap. A mistake in Turn 3 sent Jason off track. He recovered quickly, but came up just short of 2nd place by 0.187 seconds and a disappointing 4th place. “Started way back and worked my way up to 2nd, but made a mistake last lap and ended up 4th today. Hoping for no mistakes tomorrow” stated Jason. Jason was fast in Sunday’s morning warm up, finishing 3rd in class for the session. In Race 2, Jason got a good start and by the end of the first lap, had moved into 5th place, but was still several seconds behind the class leaders. On lap 8, Jason made the move into 4th place. It took 3 more laps to catch the 3rd place rider and move back into podium position. Jason was now stalking the 2nd place rider and, with 2 laps to go, moved into 2nd place. On the final lap, Jason pushed hard and stayed focused to stay in second place this time.